On Friday, December 14, 2018, in Bogota, the plastic wood processing plant of the Waste Pickers’ Association of Bogota was launched. 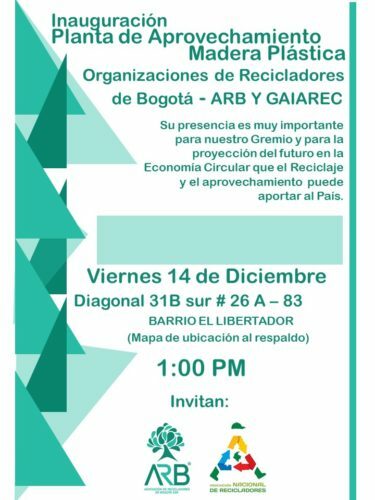 This event is of special importance for all the waste pickers of Colombia, since it became possible due to the remuneration coming from the recognition that waste pickers and their organizations have received as public service providers of waste recovery in Colombia and also, since it embodies the right to expand across the recycling value chain; a right which is also enshrined in the National Constitution of Colombia. This plant will enable the processing of multiple types of post-consumer plastic packages which do not have a market in Colombia. With them, construction solutions will be produced in the first place for waste pickers and then, in a wide range of opportunity niches. This process had the technical support of the Foundation “llena una botella de amor” (fill up a bottle with love), which started this productive initiative several years ago in the municipality of Rionegro (Antioquia). Today, they have increased their effort to build housing solutions around the whole country and in other Latin American countries.